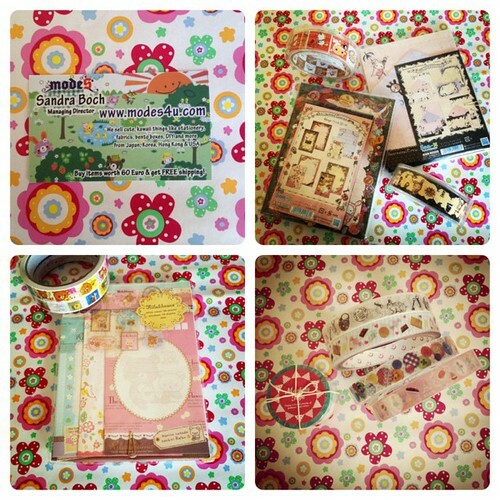 I came across a blog that mentioned modes4u and being a stationery manic I had to have a look so fell in love with a lot of items. I didn't plan on buying anything but was offered a 10% discount plus with the free shipping I decided to get somethings. I really wanted the Sentimental Circus sets as I needed something to go with my tapes that I bought. 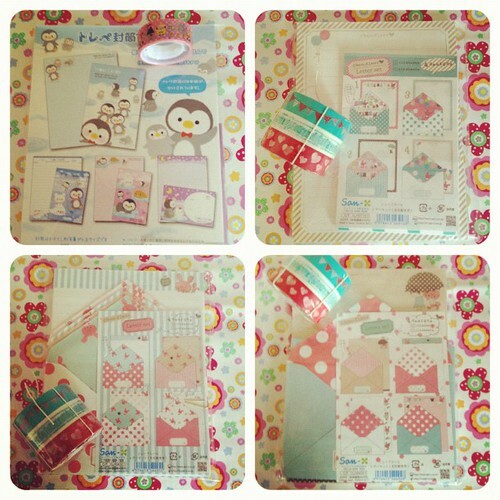 I do have some Rilakkuma sets already but I don't know why I don't enjoy writing on them but when I saw this set I really liked the design and decided to get it... after all I needed to make it to £54 for free shipping. As for tapes there were so many I wanted, added them all to my cart and then deleted them because as you know already I have so many and I like using what I buy where as other people buy all that they like and may never look at them again. Also I never buy anything with the intention of keeping it as I give some of it away as presents but I really need to start keeping a list of what friends buy me because I don't know what I have bought and what has been given so there will come a time when someone is offended that I've passed something on that they gave me. Everything I have though I really like so its not a case of passing rubbish on. I bought some making tapes and absolutely love them, I would have been tempted to buy more if it wasn't for the problem with the package, I can't risk it again so will never buy from that store again which is a shame. I love having winter themed letter sets to write on in winter but there aren't many out there to buy. Plus those penguins are so cute. The little tape was a free gift. Lastly three Chou-Fleur Bunny Lettersets, I've never come across this rabbit before but I love the softness of the colours and design of it that I couldn't help buying all of them and I'm so glad I did plus those masking tapes go so well with these sets. Its just a shame I never use envelopes as these are all so lovely looking. I wish I could have letters every week as its nicely spread out and something nice to look forward to after work but sadly I usually get all letters around the same time and then can have a month or two without anything! Its been a little more consistant lately though which is why make my day has suffered some what craft wise as my letters come first. Have you had a good mail week? 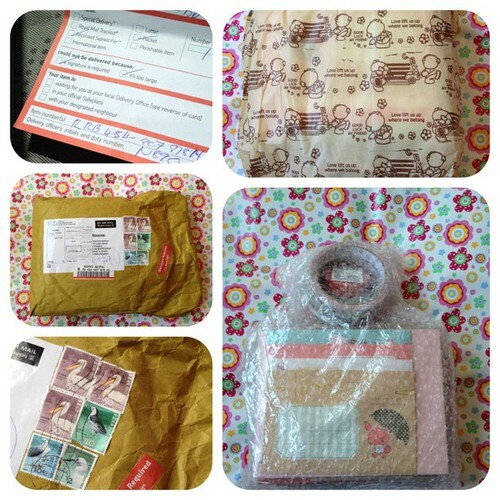 Did you receive any surprise? Oh its actually a bad time to ask because I'm cutting back, someone actually asked me on my blog the other day and I was tempted but then decided it was best not to as make my day is already suffering as I haven't crafted for it for ages. Sentimental circus indeed is really cute. I know its great! I would have love to have shown the envelop but unfortunately theres no way to edit the address on my photo without first posting it and then editing it but it was such a cute and colourful one. Oh! I could gladly do that, be your personal shopper as I see so much cute stationery but don't end up buying a quarter of it so it would be nice to buy it for someone else. 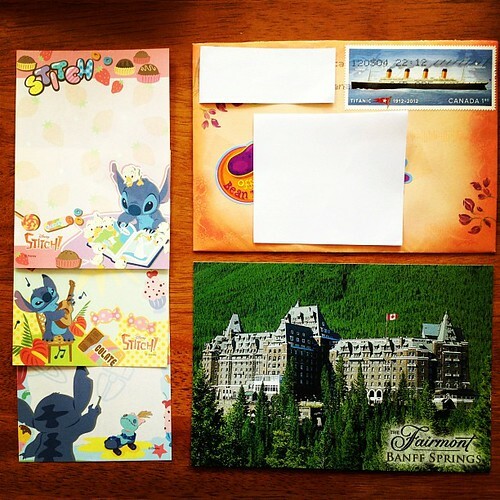 Thanks for the added info on Banff national park its such a beautiful location by the looks of the postcard.